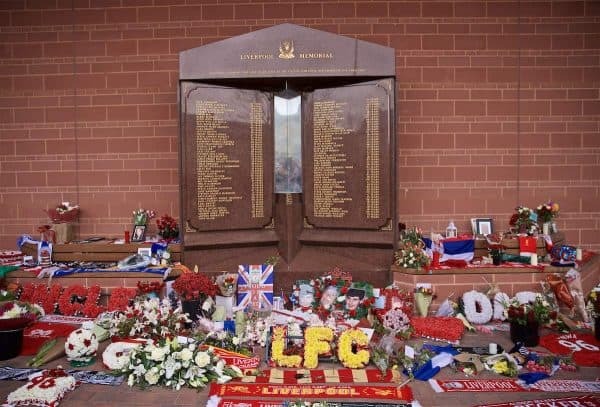 Monday, April 15, 2019 marks the 30th anniversary of the Hillsborough disaster. Here, Chris McLoughlin recalls his memory of the day that saw 96 lose their lives. It’s the queuing I remember. Queuing in an eerie silence I had never heard before. Standing there, with thousands of others, just waiting. I can’t remember exactly where we joined the queue. Somewhere alongside the railings next to Stanley Park car park, I think, where the ‘hats, caps, scarves, badges or yer t-shirts’ fella usually was. But he wasn’t here today. It wasn’t a matchday. I’d only ever been to Anfield before to see Liverpool play. It was always noisy outside the ground. But this was different. Very different. It was the moment when it brought home to me exactly what had happened at Hillsborough. I wasn’t at Hillsborough on April 15, 1989. I wasn’t allowed to go to away matches. I was 11, in my last year at junior school. Considered too young. In any case, my dad was a Blue who used to stand on the Kop during Merseyside derbies so there’d probably have been more chance of me being taken to Villa Park to see Everton that afternoon if we’d gone to a cup semi-final. It had been hard enough persuading him to take me to Anfield from 1987 onwards—he made me go to Goodison Park too as a condition (in a last-ditch and ultimately failed attempt to convince me I should be a Blue)—but away games were out of the question. Our family went to buy a new washing machine instead. I spent the afternoon watching the tragedy unfold on 20 tellies in Curry’s. The magnitude of what was happening didn’t initially sink in. 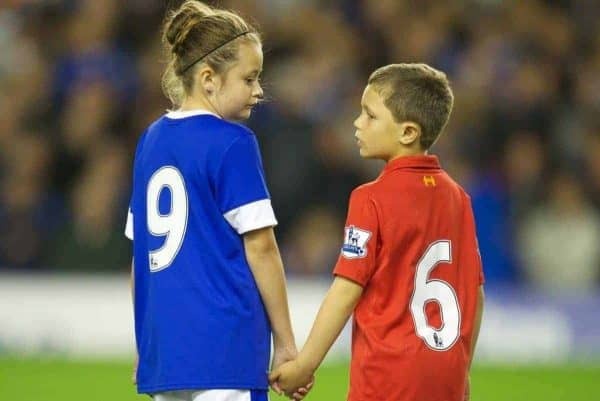 At first I remember being disappointed that the game had been called off and there wouldn’t be any highlights on TV that night (neither FA Cup semi-final was screened live in 1989—both were 3pm kickoffs but BBC Grandstand switched live to Hillsborough as the tragedy unfolded). Then, as talk of a death toll emerged, the realisation that Liverpool fans had actually died kicked in. The following morning I turned up to play for my Sunday League under-12s side. All the talk was about Hillsborough. The older brother of one of the lads in our team had gone to the game. He was OK. I can’t say for certain, but I think he’d been sat in the upper tier of the Leppings Lane end. I remember feeling glad he was alright and that now I actually knew someone who’d been there. We held a minute’s silence before the game. 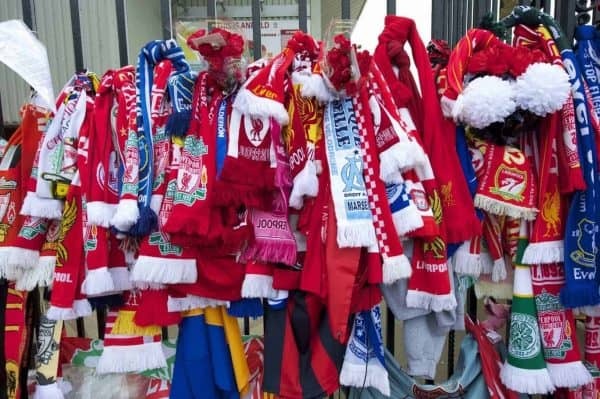 The silence of people queuing outside Anfield to pay their respects lasted a lot longer. It was hours before we got into the ground. No-one complained. We just queued. As we did so I’d thought to myself that for the first time I’d actually get to walk on the Anfield pitch and stand in front of the Kop. That was an exciting prospect. I’m sure I was not the only 11-year-old in that queue who was thinking along those lines. My excitement immediately disappeared when I entered the ground, down in the corner of the Annie Road end, next to the old Main Stand. Seeing Anfield’s pitch and the Kop covered in flowers on the telly was one thing, seeing it with my own two eyes was another. It took my breath away. This wasn’t Anfield. Not the Anfield I’d been to before. This was a shrine. A shrine of the like I’d never seen before and have never seen since. 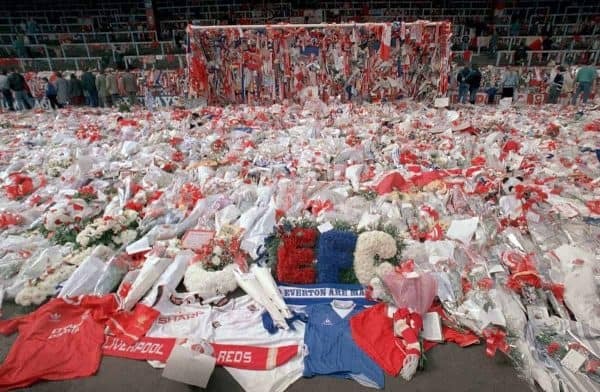 It sounds ridiculous, 30 years on, to think of this, but I remember specific things that had been placed on the pitch. An umbrella. Flowers that spelled out You’ll Never Walk Alone. A mirror, in a red frame, that had the classic club badge of the time engraved into the glass. 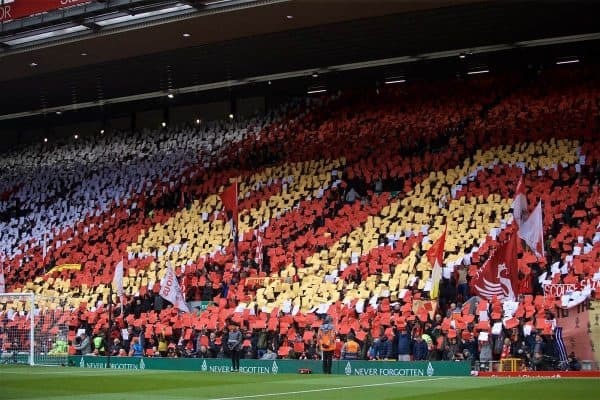 And I can still see what I can only describe as a haunting vision of thousands of scarves, but not thousands of people, tied to the crush barriers on the Kop. You know how people attach padlocks to railings, gates and bridges in tourist locations now? Like on the black fences down by the Mersey, near the Albert Dock? It was like that, but with scarves of every different colour instead of padlocks. It felt like someone had stolen all the people and left scarves where they once stood. My mum laid flowers on the pitch, a pitch now covered with floral tributes, beyond the Kop end penalty box. There was no particular reason for that spot, it was simply where the ever-lengthening queue of flowers had got to. It was the next available space the stewards directed us to. My brother and I had taken our treasured Liverpool scarves with us. We’d only got those scarves quite recently, if memory serves me right during the 1987/88 season—my first proper full season of being a match-going Red. They were our ‘best scarves’. Much thicker, warmer and redder than our originals. I dunno about our kid, but I remember being reluctant to part with mine at first. It was only when we’d walked back down the Kemlyn Road touchline towards the Annie Road end that I decided to leave it there. I gave that scarf to a steward who tied it to the side-netting, that glorious, stringy, loose-looking red netting, on the goal down the Anfield Road end. By then I’d only ever sat in the Annie Road end to watch Liverpool, in the multi-coloured seats in the section now used for away fans as that’s where the adult-child section used to be. It seemed somehow appropriate that my scarf ended up down that end, but no-one was allowed to walk to the goals. The steward took it instead. We left the ground via the away terracing in the corner of the Kemlyn Road Stand and I remember looking back towards the Kop and thinking how eerie Anfield was. 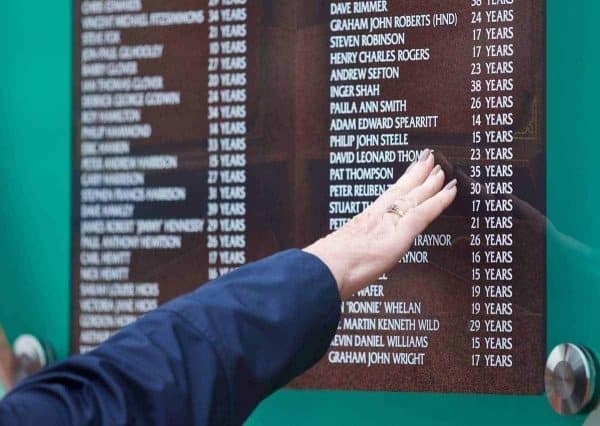 Thirty years on and I can remember that day as if it was yesterday, so I cannot begin to imagine how the families and friends of the 96 and the Hillsborough survivors feel today. I doubt there’s nothing different that can go through their heads today than has been doing so for the last three decades. All I can do is admire their strength. I know of someone still being treated for their physical injuries from that day. I know survivors who carry the mental trauma of it with them every day. I have a friend who was in the upper tier at Hillsborough 30 years ago today and now can’t remember what she saw due to dementia. I know there are thousands of others who remain affected 30 years on. I know there are kids who have grown up without a parent, parents who have grown older without their kids. 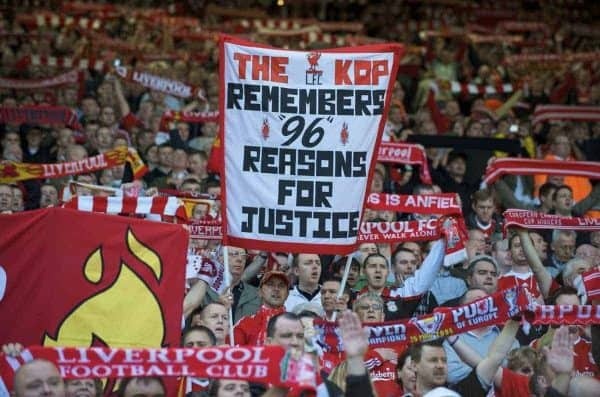 And I know all of them—frustratingly—have to be as silent as Anfield was in the aftermath in 1989 today because nobody can risk prejudicing the ongoing legal process. Chris McLoughlin writes for This Is Anfield each week; he’s also senior writer for the Official LFC Matchday Programme and LFC Magazine.